Slam the door on the doctor's nose." A million years ago, man was not worried about a three-hour trading glitch and what it will mean to his portfolio. He wasn't thinking about how the financial pressure from $20,000-a-year pre-school would strain his marriage. He was not worrying about if his daughter would get into private school or have to end up at the "mediocre" public school, permanently stymying her path to an Ivy. He wasn't thinking about the unemployment rate, or if our politicians were helping our hurting the issue. He wasn't worried about how his entire industry is getting upended by technology. Nor was he concerning himself with navigating an increasingly politically tricky career path amid a global economy that feels tenuous at best. He was also not aware of this 3-millimeter lesion on his lungs that could be something, could be nothing, but was found only because recent ultrasound technology made it possible. He didn't respond to emails 24/7, or stare at sleep-hindering screens before bed. And he also didn't have access to 24-hour cable news, the internet, and what feels like thousands or sources of too much information, overloading his brain, confusing him, and elevating his blood pressure along with it. No, prehistoric man was worried about finding food and not becoming food. Almost sounds kind of nice, doesn't it? Our body's stress response system was formed during the days when our biggest stressors were rather primitive - must find something to eat, must run from lion. Relative to the existence of man, our modern day stressors are merely a dot on the historical timeline. They're new, very very new. Yet our stress response system remains quite old, and it's killing some of us. Literally. In his fascinating book, Why Zebras Don't Get Ulcers, Robert Sapolsky, biology and neuroscience professor, calls running for your life from a lion and the like an "acute physical stressor." He describes the kind of stress that occurs when drought destroys a season's crops, leaving you to wander for six months to find sufficient food as "chronic physical stressors." Our bodies are well equipped to respond physiologically and healthfully to these two stressors. What we are not well equipped to respond to is a third and new category, the "psychological and social stressors." The amygdala is the part of our brain that processes memory and emotional reactions, and triggers the fight-or-flight response when a threat is perceived. Unfortunately, the amygdala is pure instinct; it can't differentiate between an over-bearing boss and a bear in the woods on the attack. In both cases, the amygdala perceives threat and instinctively causes our body to release stress hormones that elevate our heart rate and blood pressure. Fight-or-flight also heightens our senses, and stops functions like digestion, growth, reproduction and immune-resistance so that all the body's energy can be directed to saving our life. When we actually need to save our life, these are all good things. But when we are under persistent, prolonged duress, our body's lack of attention to these other critical functions begins to threaten our health. In her book, Mind Over Medicine, Dr. Lissa Rankin sets out to prove scientifically that our mind's response to stressors has a tremendous physical impact on our body. 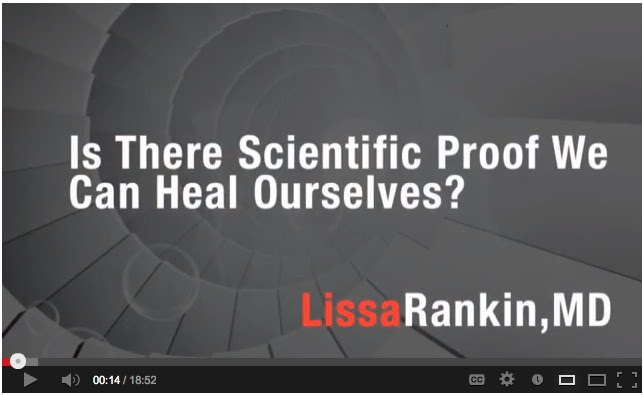 The crux of her research is this: Our bodies naturally can and want to heal themselves. When our bodies are in relaxation mode, they will be able to do what they do best - fight off threats to our immune system, heal issues, keep us young, and find homeostasis. When we are stressed, our bodies are ripped out of homeostasis and self-repair mode. Get that? Every time you feel stress, you are denying your body its ability to self-repair and you become more vulnerable to disease and illness. In the face of our new, modern day psychological and social stressors, this is not good news. The average person today has fifty stress responses per day - a reality that most of us are not evolutionarily prepared to handle. Thanks to advances in science and medicine, we are also living far longer than our primitive predecessors, allowing us to live long enough to, in effect, fall apart. Just one hundred years ago, we were worried about dying of the flu at age twenty. Today, we worry about dying from cancer, heart disease, or other illnesses that are the result of a slow accumulation of damage. What the relatively new field of stress physiology has shown us is that our minds and emotions can have an intervening impact on these diseases - for good and bad. We are living in stressful times. The post-Industrial Era created great prosperity and brought with it all sorts of new things to worry about achieving and losing. Our economic, geo-political, social and physical stressors are very real. To add insult to injury, unlike our grandparents, we can read about all these things to worry about all day, straight from our phones. Let this unbelievable fact settle for a moment: In today's modern world, we are trying to process as much data in a day as people used to take in in a lifetime. In this context, ever-growing cases of attention deficit disorder, chronic fatigue syndrome, depression, anxiety, and post-traumatic stress disorder make sense - our brains and stress response system haven't caught up to handle all the inputs our world puts on them daily. In this thought-provoking TED Talk, Juan Enriquez, a sort of genome philosopher who studies the intersection of science, business and society, points out that historically, several species of man have coexisted. Minute mutations in modern day man's genetic sequencing suggests that still might be the case. He also suggests that the brain is where we can expect to see "enormous evolutionary pressure today," on account of the number of inputs on it, as well as its plasticity. Citing the rapidly growing prevalence of autism, Enriquez suggests that the brain might presently be evolving, figuring out how to adapt to modern-day data overload. If Enriquez is right about brain evolution, might we be able to evolve our brain's response to develop less harmful physiological responses to today's new stressors? Can we consciously manage our attitudes, maintain perspective, and mitigate our emotional responses to these stressors to affect evolutionary development for better physical health? Will our great grandkids be wired to sustain persistent psychological stressors more healthfully? Time will tell. In the meanwhile, read on below in this month's special section about how our modern day stressors affect our health, and what you can do about it to enjoy a long, healthy life. In this spirit, we wish you a happy, relaxing and restorative Labor Day weekend. Recent articles in numerous business periodicals suggest that the leaders in economic growth are once again the developed economies of United States, Europe and Japan, surpassing the once-surging emerging markets. To many, this may seem a validation of economic policy in the more civil and "well-managed" developed world compared to that of the crude and volatile emerging markets, still trying to develop their middle class. Let's not be fooled by such a change in economic circumstances. The developed economies would be the disaster economies for not government fiscal and monetary stimulus on a scale never seen before in modern times. Throw trillions and trillions at a problem and at some point it will look like it's solved. So when we read headlines of wonderfully improved auto and home sales, let's realize where the money is coming from to afford such economic activity. It's coming from our children, who will be responsible for paying off the enormous debt we are accumulating, as well as dealing with the huge misallocation of capital to keep alive not just the too big to fail, but the too small to fail as well. This is today's cost of civility, as no one is prepared for an unraveling of the highly interconnected and, consequently, interdependent global economy. We are living through an economic experiment like none before. No policy has been changed to improve the structural foundation to our economy. All that has transpired is an enormous papering over of the problem. We are not fixing structural imbalances, but instead perpetuating the structural challenges that first appeared in the 2001-2002 recession. Years from now, we will likely look back and realize why this economic period was called the Great Recession - because it actually started in 2001, and, not withstanding official data, for most people in the developed world, it remains today. As has been reported for many months, employment continues to grow, but anyone willing to dig into the data will find that since 2008, more lower paying jobs are growing than were lost, and fewer higher paying jobs are growing that were lost. Considering the poor results lately from retailers and their near-term guidance, our national job growth isn't resulting in any worthwhile gains in retail consumption. The bottom line is that we are not creating enough well paying jobs. The news of job growth in the oil & gas and energy infrastructure markets is no longer confined to Houston. Recently, an economics group in Colorado determined that even when you include people working at gas stations, jobs being created in Colorado's energy industry are paying almost twice the country's median wage. Why is it so hard for so many people to understand that creating an energy job versus a retail or restaurant job is much more economically stimulating? The more energy and energy infrastructure jobs we create, the more retail and restaurant jobs we will eventually need. To mainstream economists, the traditional catalysts for economic growth have been population and productivity growth. To "modern" economists, the catalyst is government policy. But before we even understood any of these catalysts, the historical catalyst that always precedes any economic growth is the availability of needed natural resources. All economy begins with natural resources. Accessing more natural resources creates many jobs, not just in their extraction, but also in their transportation, their processing into intermediate production raw materials, the transportation of those raw materials to finished goods production facilities, and then the actual production and transportation of finished goods. No data seems to exist, but common sense would suggest that job growth in the oil & gas extraction industry creates a waterfall of job growth both directly and indirectly in many more industries. Given the topic of this month's newsletter, we probably should revisit some previous thoughts on increasing our individual productivity. Sometimes you have to lose your mind just to keep your sanity. Although we may believe today's world is much more stressful than that of generations before, this belief may be a tendency of every generation since the Industrial Revolution. Since then, change has been the constant. But of course, today we might argue that the pace of change has significantly increased its momentum. If so, then our prescription for not just peace of mind, but also for improving our personal productivity is to spend substantial time distracted from our responsibilities, not to mention from the time we spend thinking about trying to be the hardest worker at the office, the richest person on the street, the smartest person in the room, the best parent at the school, the fittest person in the gym, and the most attractive and witty person at the dinner party. Happy pills and procedures are not the panacea. Sitting still and quiet in a place surrounded by nature and not crowds of people, things, and TMI may be the best medicine. From April to July 2013, the number of employed youth 16 to 24 years old increased by 2.1 million to 19.7 million. This year, the share of young people employed in July was 50.7%. (The month of July typically is the summertime peak in youth employment.) Unemployment among youth rose by 692,000 from April to July 2013, compared with an increase of 836,000 for the same period in 2012. Real average hourly earnings for all employees fell 0.2% from June to July, seasonally adjusted. This decline stems from a 0.1% decrease in average hourly earnings and a 0.2% increase in the Consumer Price Index for All Urban Consumers. Unit labor costs in nonfarm businesses increased 1.4% in the second quarter of 2013, the combined effect of a 2.3 percent increase in hourly compensation and the 0.9 percent increase in productivity. Over the last four quarters, hourly compensation and unit labor costs both increased 1.6%. 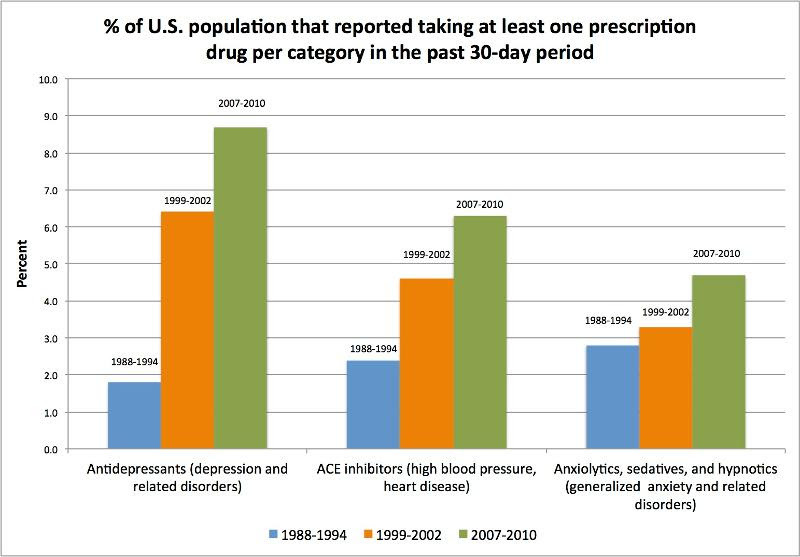 The use of antidepressants has grown 400% since 1988. Prescriptions for anxiety disorders and high blood pressure have also spiked. This growth is the result of a host of reasons, a noteworthy one being the relatively newer practice of pharmaceutical companies marketing directly to the consumer. These medications may certainly be helpful and life improving to those suffering a clinical disorder. However, the issue comes with a questionable trend: "Nearly two-thirds of a sample of more than 5,000 patients who had been given a diagnosis of depression within the previous 12 months did not meet the criteria for major depressive episode." Are we too quick to throw medicine at the problem instead of attempting non-pharmacological therapies to alleviate a stress-related illness, as well as teach coping mechanisms? A study published in the British Medical Journal shows that those claiming mental health issues like anxiety and depression are 41% more likely to die a cancer-related death, 29% more likely to suffer heart disease, and 21% more likely to die from an external cause, like an accident, than their stress-free counterparts. The report cited physiological changes in the body due to stress effects that predisposed these subjects to disease. Since the dawn of man, we have always looked for the reigning indicator of status when seeking a mate. Today, the reigning status is the ability to accumulate resources. This is indicated through wealth and things, which comes with success, which has become associated with stress. Stress shows the world we're in demand, important, busy. 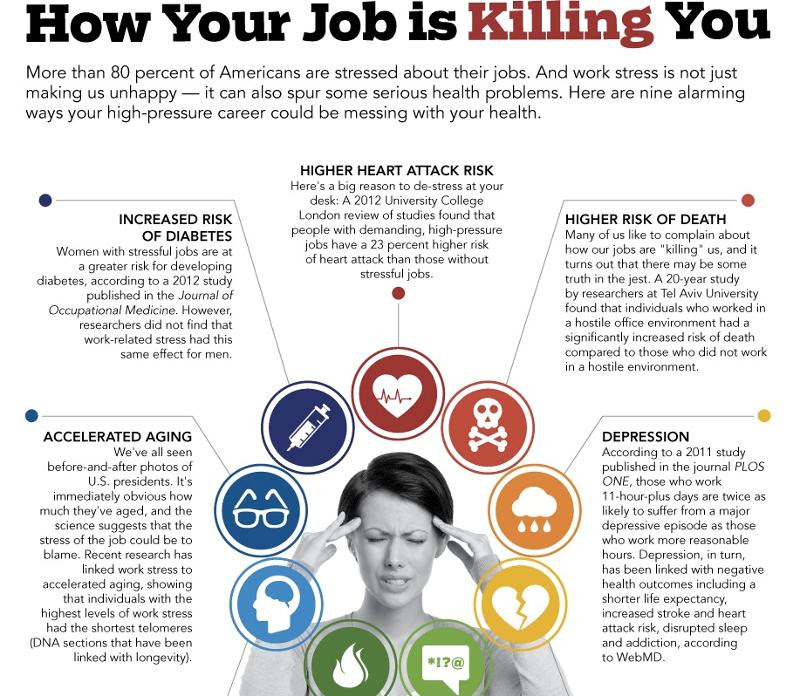 But not only is stress damaging our mental and physical health, it's also costing us in other ways. Click here for a list of lesser-considered opportunity costs that results from our overly-scheduled "successful" lives, including missed opportunities to save money, wasted resources due to disorganization, and wasted time due to poor planning. Here are the many ways persistent stress from work - or any constant source of anxiety - can manifest into physical health issues. Click the link or image for the full infographic. Out of frustration with western medicine's tendency to omit the mind from diagnosis and healing, Dr. Lissa Rankin left her traditional OB/GYN practice to explore the connection between emotional and physical health. As a physician, Dr. Rankin had seen and heard lore-like tales of spontaneous remission and miraculous recoveries that defy science. In her TED Talk, she discusses her findings, which include evidence that those under the care of optimistic doctors or healers have a much higher chance of recovering from illness. Much of her research points to how critical a positive mind is to good physical health. In her inspiring TED Talk, Shannon Paige, activist and yoga instructor, explains the unexpected: That the experience of surviving cervical cancer at age 21 put her into a deep depression. To heal, she used strategies from the "mindful movement," a Buddhist-derived practice that focuses on acute awareness of the present, rather than stress-inducing memories from the past, or anxiety-triggering concerns about the future. Breathing is the most common method of mindfulness. Paige cites a Johns Hopkins study showing that cancer cannot exist in a high-oxygen environment, nor can stress or depression. Watch the video to learn how to utilize mindful breathing to improve your health - mental and physical. The average American adult spends 60% of his waking hours sitting, mostly in front of a computer. Data shows us that all this sitting can shorten our life spans, lead to weight gain and osteoporosis, and increase our blood pressure, and is generally bad for our health. This article suggests several ways to increase movement throughout the workday (including the treadmill desk! 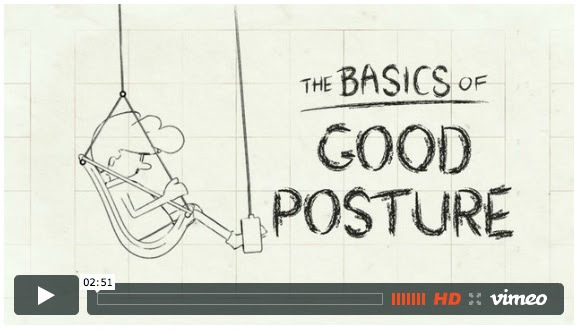 ), and the following video teaches us how to sit with posture that mitigates the harm of prolonged sitting. Exercise isn't just endorphins, weight loss and self-confidence. Research shows two key things happen when we exercise that impact our body's stress response: 1) Stress damages the part of our brain responsible for remembering, which is why we often feel forgetful amid stress. Exercise reverses this damage by promoting the production of neurohormones, which improve cognitive function, elevate mood, and can even make us smarter. 2) The sympathetic nervous system gets triggered in the face of threat, which then sends a panic signal to the body's other systems. Exercise actually improves the communication between all of our different physiological systems, so that in turn, exercise trains our bodies to respond to stress more effectively and efficiently. 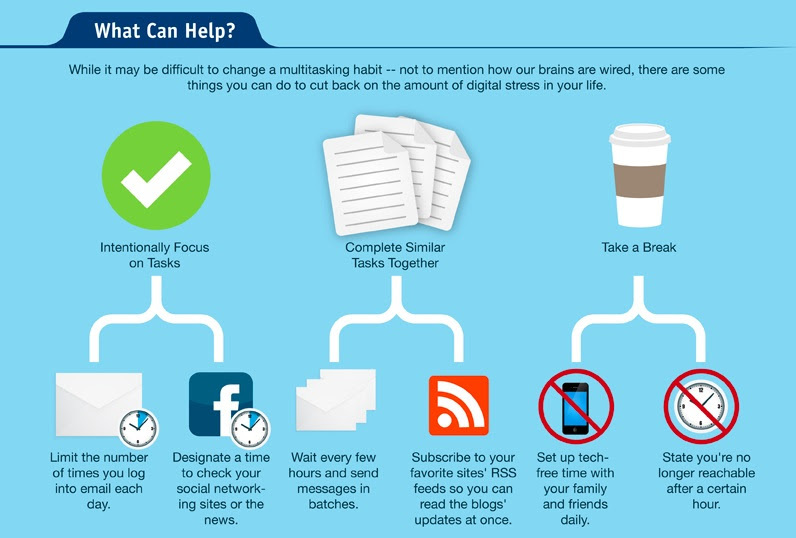 A serial entrepreneur, and admitted stress-case, lays out six tips for coping with stress that have worked for him. The first begins with being honest about how stress is seeping into all areas of life and admitting if it has gotten out of control. From there, he offers five more tactics to overcome stress before it overcomes you. "Fresh air impoverishes the doctor." 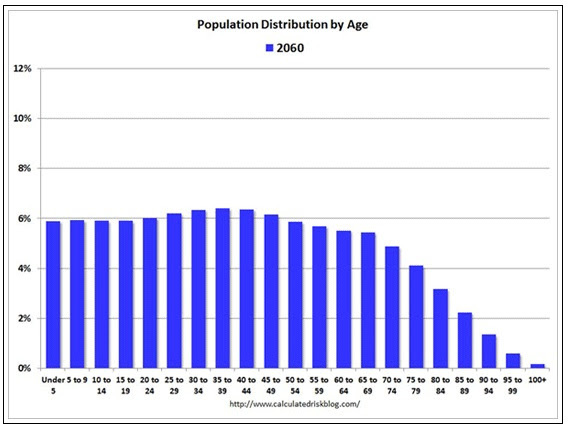 Click the link or the charts below to see an animated version that shows how our population has changed and will change from 1900 to 2060, which has varying economic implications at every stage. 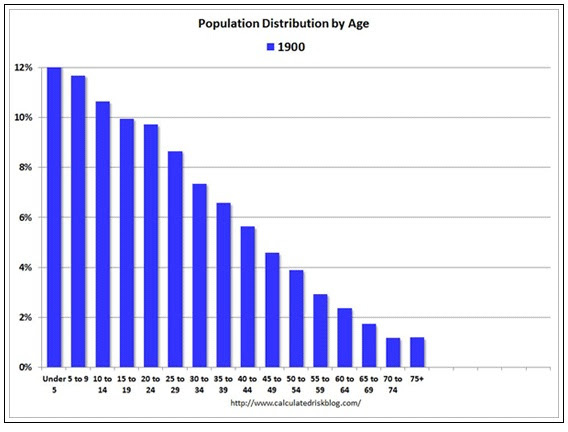 The difference between age distribution in 1900 and 2060 dramatically shows how improvements in healthcare have prolonged life. According to Gallup, twelve percent of workers have been diagnosed with depression at some point. 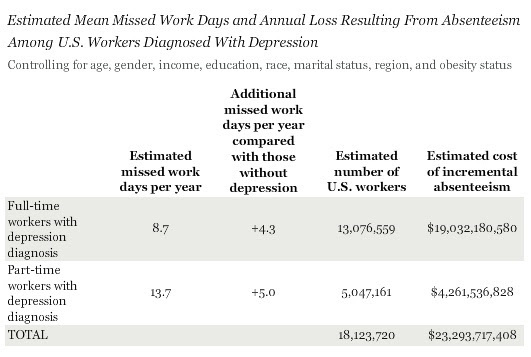 This segment misses an additional 68 million workdays per year compared to those not depressed. Employers pay approximately $23 billion annually for this loss in productivity. Two members of a leadership consultancy developed an eight-minute quiz to assess your strengths and weaknesses as a leader. Upon completion, you'll immediately get a report that compares how you rate against 45,000 other leaders. The quiz also measures your engagement and satisfaction in your leadership role. Former diplomat under two administrations, Carey Cavanaugh, shares the commonalities between diplomacy and business, and how leaders can improve their business relationships by drawing on tactics of successful diplomats. Tips include how to maintain honesty when certain business dealings have to remain under wraps, and how to listen more than you talk to make others feel valued. Inaccurate first impressions account for several hiring errors. To preclude this, this article suggests spending an interview looking for the "achiever pattern," which speaks not to a candidate's credentials or personality, but to how the candidate's on-the-job performance has been recognized. Clues include placement on key multifunctional teams, promotion history, and opportunities to present skills to senior executives. Read on for more signs that you've got a high impact candidate on your hands. Similar to the prior link, Neil Roseman, former VP of Technology of both Amazon and Zygna, has grown tired of Silicon Valley companies who pride themselves on hiring "only the best and the brightest." After repeatedly seeing a giant gap between employees who actually get things done and those who don't, GPAs and pedigree are irrelevant to Roseman. Instead, he's developed an interview strategy aimed at drilling deep into a candidate's skills, accomplishments, cultural fit and leadership potential. Read on for his plan to identify high performers.